BROWNRECLUSE wrote: I really want to do something with Bitcoin but have no idea where to get started. I'm no financial expert but I don't think now is the time to start buying bitcoin. Yeah, I'd stay the hell away from Bitcoin. Maybe look into other crypto-currencies like Ethereum or something. That's all I know about crypto-currencies, based on what Philip DeFranco and Marketplace has told me (and the rest of their audiences). JamishT wrote: Yeah, I'd stay the hell away from Bitcoin. Maybe look into other crypto-currencies like Ethereum or something. That's all I know about crypto-currencies, based on what Philip DeFranco and Marketplace has told me (and the rest of their audiences). I would guess because they're still cheap. 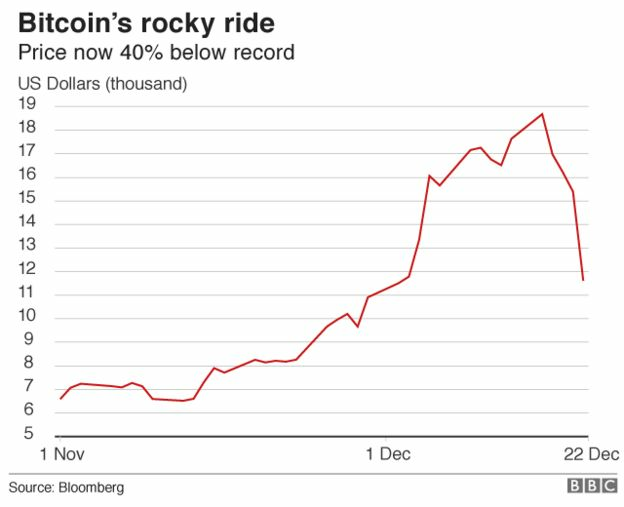 Bitcoin is getting all the attention right now, and the sharp rise in value is a classic bubble. Also, the wild fluctuations in value can make you lose a lot of money quickly, especially with a value of 20k like it has today. Ethereum is only at $400ish right now, and is getting far less attention. There are other similar currencies that are getting even less attention, but I think people are starting to look to them now that Bitcoin is out of reach for many. Also, when Bitcoin blows up, people will flock to other such currencies as well. One thing to keep in mind is that you should not invest more money than you are willing to lose. 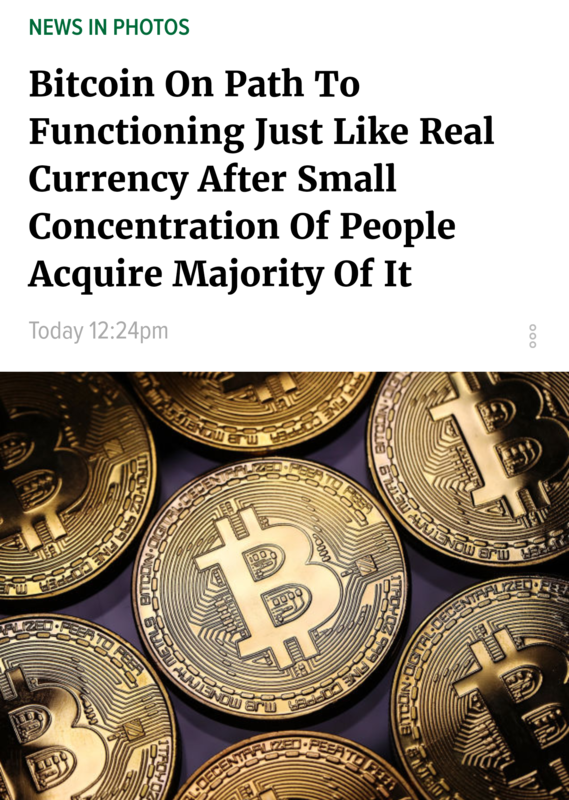 I would bear this kind of article in mind when considering bitcoin. What goes up must, eventually, come down and I wouldn't be confident in a currency currently worth $17000 - B1 maintaining anything like that level of value for long. As Jamish wisely said, it looks like a bubble and it might be worth looking at competitor cryptocurrencies in order to avoid buying in when the market for bitcoin is high and making losses. Of course it might go up more, but I don't think it'll be forever and profit return on the amount of money you'd need to put in would be so low that it probably is out of reach for individuals at this point. I guess I should have clarified that the surge in bitcoin has got me very intrested in cryptocurrency. I certainly am not able to purchase bitcoin at that price so alternative forms are certainly more reasonable. I just bought some lite coins err coin, it seems to be doing good and a lot cheaper with it being around 200 right now. To everyone in the US: If you have a 401(k) and aren't maxing it out your contributions to it (15% income, IIRC), focus on that before any other investments. Don't bother planning out where to put the money, or which stocks, or which funds. Put it all in the longest term Vanguard fund you can find (30 or 40 year, if possible). If you can't afford to max out your contributions, at the very least max out your employer's contributions (if your employer matches up to 5%, invest at least 5% of your income in your 401(k)). Employer matching is free money, so it's beyond stupid to give it up. As was said before, Vanguard and other funds invest your funds extremely diversely, which essentially means you're not investing in any companies or industries, but the market as a whole. Year over year changes don't matter. Some years you'll be up, some years you'll be down, but over the course of 30-40 years, the market will be much, much higher than it was when you started, and all your compound interest will have given you a huge amount of money by the time you retire. If you don't have a 401(k), invest in a long-term mutual fund anyway, for the same reasons. Your employer won't match (since it's not a 401(k)), but the rest of it still applies. After that, individual investments should be one of two things: Either 1) Extremely safe, low risk stocks like public utilities that pay dividends. You'll never make much trading utilities stocks, but they aren't volatile and will give you a nice steady income (which you can reinvest in the market, for more money! ), or 2) Riskier, less safe stocks in companies and/or industries that you genuinely understand better than the market at large does. If you know a ton about drones, to the point where you can reasonably decide what drone technology will do well, what will fail, and which companies will succeed, then invest in drones. If you don't know any more than the market as a whole does, all you're doing is making risky bets that you don't understand. It might work out sometimes, but it's pretty much exactly like gambling at a casino. You might get ahead temporarily, but the house will win in the end if you keep playing long enough. Things like this are extremely important to keep in mind. Mutual and hedge fund managers spend their entire career studying which stocks will do well and which will do poorly, and the overwhelming majority of them still underperform the market. If people with expensive software studying the market all day long can't beat the market, there's no way 30 minutes a day on Yahoo Finance will leave you anything but stunningly unqualified to try to do better than a standard unmanaged Vanguard mutual fund. There are a few exceptions, of course. Every once in a while a hedge fund manager will discover some secret and make all his investors rich overnight. You hear about them on the news every once in a while. Don't let this trick you, though. The reason it's big news when it happens is because it happens extremely rarely, and almost none of the managers who outperform the market continue to do so for long periods of time. Investing really isn't as hard as people think. The market performs best 99% of the time, so 99% of the time you should just do what it does, and you do that by investing in a diverse mutual fund over a long period of time. Simple, effective, and proven by time. Tess told me I should share my views here. Keep in mind that I have never really been in a position to invest, so this is entirely speculative. But for a long time I've believed that if I had money, I'd invest it in developing countries. Developing countries tend to have higher growth rates than the US. They're also much riskier, but you can avoid a lot of that by looking at factors outside of growth rates. The ease of doing business index, the history of defaults by both that country and other ones in the region, and the political stability of the government of the countries I'd invest in would all be factors. However I'm become strongly convinced of the wisdom of this after reading The Undoing Project, and even more convinced after talking to other people on TCS about this. The Undoing Project highlighted how irrational investors are, and I started thinking about how both Goldman Sachs and BBVA decide what countries are good to invest in based on large part on how large they are. Brazil, China, and Russia all seem like terrible places to invest, but because they have large economies they're treated as good places to invest by these investment banks. Then talking to Tess, her first impulse for where to invest is Brazil, which with lots of red tape, an unstable government, and its location between neighbors prone to defaulting made me say "Jesus no!" Someone else brought up someone who lost a lot of money on Venezeulan government bonds, which are A. bonds and B. from a country which known for its instability and disrespect for private property. I suspect that most people who invest in foreign countries aren't using models, and that while big investors like Goldman Sachs and BBVA do use models, those models focus on quarterly returns and assign insufficient weight to underlying political conditions. I also suspect that they let "experienced" employees ignore the model if their intuition says they should, even though in the long term this is a bad policy if you have a good model. Build a model for which countries to invest in, mostly focusing on political conditions in those countries and their neighbors (Mali has highlighted to me that stable countries in an unstable region can be fucked up by unstable neighbors, and that needs to be taken into account), together with the growth rates of those countries' stock markets. The Ease of Doing Business Index, Civil Unrest Index, and Corruption Perceptions Index are three factors I would definitely certainly incorporate into my model. Invest only long-term, in the stock markets of those countries and/or in microfinance projects in those countries. Only withdraw if a political shift (a coup, for example) drastically changes my long-term projections. To start with, mostly invest in blue-chip companies in those countries. Blue chips in developing countries can have impressive growth. Build a model for microfinance investments and stick to it strictly. Invest in some startups where there's a reason to believe that there's a huge market. Cell phones in Africa leapfrogged the traditional telecoms sector and solar panels look set to do the same, so for African countries that look promising, companies that install solar panels are a good bet. Not only do I imagine that most investors aren't market geniuses but most customers probably aren't experts in what they're buying either(which is why branding, advertising, etc. can be more important than the quality of the product itself). Lindvaettr has the right of it -- it is very, very difficult to outperform the market. If you don't want to invest in funds, the key to managing risk is diversification. You want to mix different kinds of investments (stocks, bonds, etc.) as well as stocks across different industries. A good rule of thumb is to invest your age by percentage in bonds. So, if you are 30 years olds, invest 30% bonds, 70% stocks. Bonds are less risky (government bonds especially so) but have a lower potential for income/growth. As you get older, you want to make your investments less and less risky.